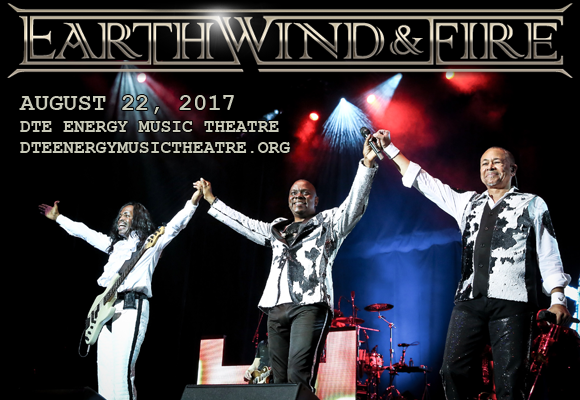 Get ready for a trip down memory lane, all the way to Boogie Wonderland as the legendary Earth, Wind and Fire head to DTE Energy Music Theatre on Tuesday 22nd August 2017, along with funk icons CHIC! In a statement, Philip Bailey of Earth, Wind & Fire said, "Nile Rodgers and CHIC are legendary for their iconic style, song, sound, and groove. Get ready for a non-stop 2054 party!" One of the most successful bands of all time, Earth Wind and Fire was formed in Chicago in 1970 by lead singer Maurice White (now deceased), grown out of his previous band The Salty Peppers. The band has sold over 100 million records worldwide, and has earned Lifetime Achievement honors from the American Society of Composers, Authors and Publishers (Rhythm & Soul Heritage Award – 2002), NAACP (Hall of Fame – 1994) and the BET Awards (Lifetime Achievement Award – 2002). Earth Wind and Fire were inducted into the Rock and Roll Hall of Fame and the Vocal Group Hall of Fame, received a star on the Hollywood Walk of Fame, and five of its members have been inducted into the Songwriters Hall of Fame. The band has received 20 Grammy Award nominations, winning six as a group, with two of its members, Maurice White and Bailey, winning separate individual awards.